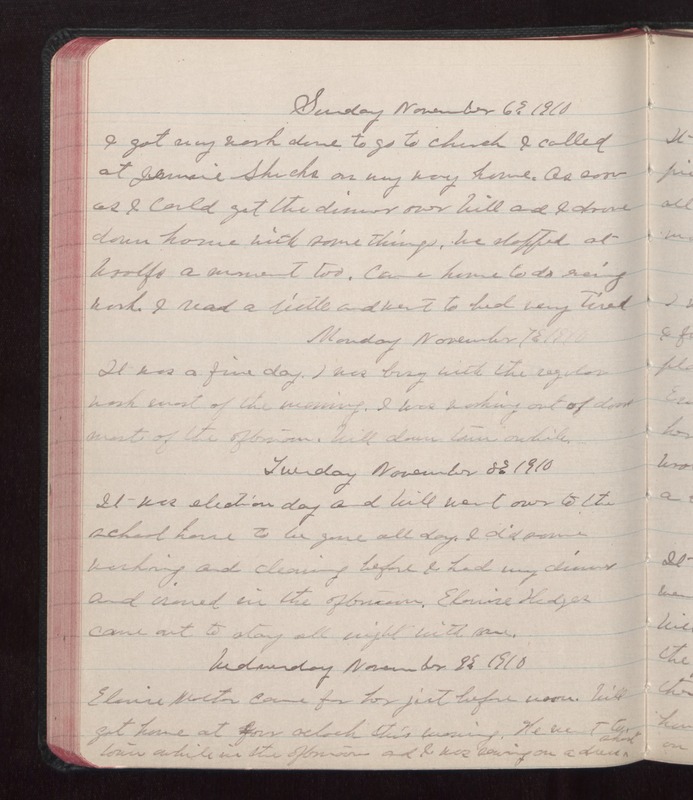 Sunday November 6 1910 I got my work done to go to church I called at Jennie Shicks on my way home. As soon as I could get the dinner over Will and I drove down home with some thing. We stopped at Woolfs a moment too. Came home to do evening work. I read a little and went to bed very tired Monday November 7 1910 It was a fine day. I was busy with the regular work most of the morning. I was working out of doors most of the afternoon. Will down town awhile. Tuesday November 8 1910 It was election day and Will went over to the school house to be gone all day. I did some washing and cleaning before I had my dinner and ironed in the afternoon. Elouise Hedges came out to stay all night with me. Wednesday November 9 1910 Elouise Mother came for her just before noon. Will got home at four oclock this morning. He went to town awhile in the afternoon and I was sewing on a dress shirt.